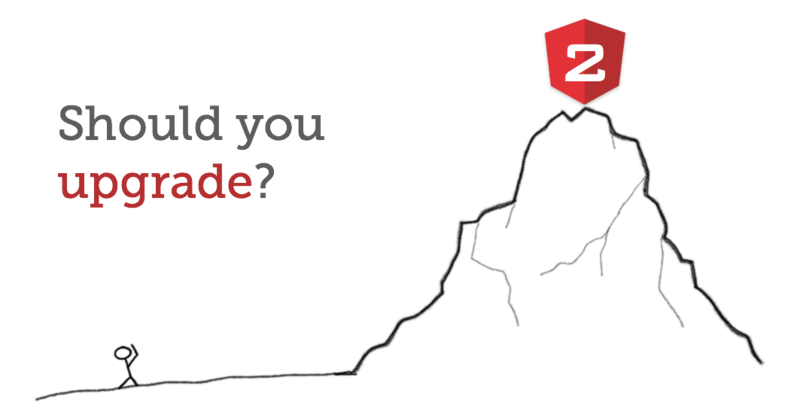 Angular 2: Should You Upgrade? Many of us Angular devs have gotten used to 1.x, and even started to like it. It feels comfortable. Our codebases are fairly organized thanks to the invention of style guides. No need to make any drastic changes. And now Angular 2 is on the horizon. It has the same name with a higher version number, so it must be the next logical step! Upgrade for upgrade’s sake. It’s what we’ve always done. It’s like someone came in and told us there’s a new sherriff in town, rules are changin’! And we might not like ‘em! One might look at Angular 2 and think “gee, this doesn’t look like Angular 1 at all.” One would probably be right. Angular 2 shares some concepts with its predecessor – the special HTML templating syntax, directives/components to modify the DOM, and a “kitchen sink” approach to including everything you’ll need to make an app – router, HTTP service, etc. Your existing Angular 1 code will need some serious changes to work with Angular 2. It’s not like a drop-in replacement where 60% of your code might kinda-sorta work: nothing will work out of the box. This is what I mean when I say Angular 2 isn’t really an “update” to Angular 1. This is important to keep in mind: if your Angular 1.x app is working fine, it’s worth considering whether you need to change anything at all. If you’ve got a fully functional 2016 Car, do you sell it when the 2017 Car with Updated Stereo comes out? Well, probably not. Your car works fine, and going through the entire process of buying a new car is a lot of work just for a fancier stereo. Now look, I’m as much of a magpie as the next guy or gal. I like shiny new toys. But just because “version 2” is out doesn’t mean we need to jump ship from “version 1” like it’s on fire. Angular 1.x is not going to suddenly go up in smoke. It’s going to be around for a while (especially if developers keep using it). We in the software profession seem to love upgrades. New version comes out, we’ve gotta have it. Sticking with the old busted one just won’t do. We need the new hotness. It’s new, and I like learning new things. Everyone is talking about it and saying how great it is. These are real reasons. All of them. Some of them are logical, some of them are based in excitement, and some are based in fear. The key is knowing why you feel the need to upgrade. Product requirements? Management says so? You just want to learn? Great! But don’t do it “just because.” It might turn out that you don’t need to upgrade after all. All the churn in the world doesn’t matter if you ignore it.